Children with allergies tend to get more ear infections, more colds, and have more sleepless nights than their peers. Far too often, the underlying allergies are missed and children are treated for each symptom as it occurs. 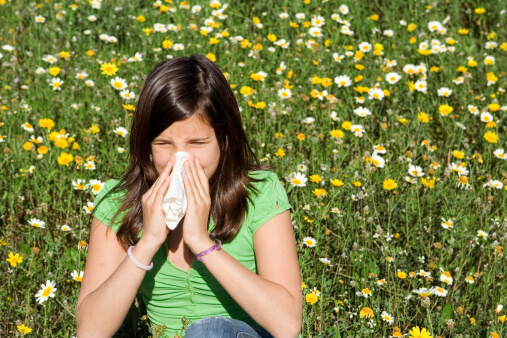 Developing allergies involves a genetic and an environmental component. Allergies tend to run in families. Asthma, eczema (atopic dermatitis), and allergic rhinitis (hay fever) often occur in the same families. Boys, firstborn children, those with eczema, those with food allergies, and those whose parents have nasal allergies are all more likely to develop nasal allergies. Early wheezing does not appear to increase the chances. Children who are raised on a farm have a significantly reduced risk of asthma, eczema, and hay fever. Children in day care, those with older siblings, those with pets, and those who get plenty of colds are also less likely to develop nasal allergies. Recent research has shown a link between fungus exposure and development of allergic rhinitis. Children with family histories of asthma or allergies who were exposed to high levels of fungus, water damage, mold, or mildew were predisposed to develop allergic rhinitis (Environ Health Perspect. 2005 Oct;113(10):1405-9). Parents are often told that their children are too young to have allergies. While allergies do become more common from ages 2 to 7, they certainly can be present earlier. Nasal allergies typically feature a clear nasal discharge with sneezing. There may be itchy, watery eyes and/or a dry cough. Parents often notice a “rabbit nose” — a child crinkling her nose to relieve the itchy sensation inside. The “allergic salute” — rubbing the nose with the hand, sometimes leaving a horizontal crease on the nose — is another common sign. “Allergic shiners” — dark circles under the eyes — have long been associated with allergies, but are less predictive than the other symptoms. The symptoms tend to be seasonal if exposure to the triggers is seasonal (like pollen), and year-round if the exposure is year round (like pets). Probably not. However, we have discovered that some allergic reactions (hives) can be spread by blood transfusion. How long does allergies last? While some children outgrow nasal allergies on their own, most will continue to have nasal allergies unless they are treated with immunotherapy. A careful allergy history and physical exam will usually point to the right diagnosis. Looking at a swab of the nasal secretions under the microscope can confirm the diagnosis. Common triggers include pollens, molds, house dust mites, and animal dander (their shed skin cells, not their hair or fur!). Identifying your child’s specific triggers can be very important. This can be accomplished with skin testing or with a blood test (RAST). The skin test tends to be very sensitive with immediate results to a broad range of allergens. The results will be affected by allergy medicines the person is taking. The RAST test is less sensitive, more consistent, and offers something of a quantitative analysis of the results. In infants, a positive result with either test is likely to indicate a real allergy, but a negative test does not give much information. In older children, the opposite tends to be true. A negative test tends to rule out an allergy, while a positive test does not prove one. Most people think of specific allergies as black and white — something you either have or you don’t. The truth is much more complex. Being allergic to something is a continuum and that continuum changes over time. Most, but not all, food allergies get better over time. Most airborne allergies get more common as children get older. Some allergies peak before puberty and then disappear. Others don’t even begin until puberty is over. Most people who do get tested for allergies have a single round of skin testing. This can provide a valuable snapshot of allergies at a single moment in time, but this just ‘scratches the surface’ of a child’s long-term allergy story. Treatment revolves around avoiding allergens and irritants, immunotherapy to desensitize people to allergens, and medicines to control symptoms. If antihistamines are to be used in children, non-sedating antihistamines (such as Claritin, Allegra, or Zyrtec) are usually the best choice in order to minimize the impact on learning. Your pediatrician may recommend nasal sprays and/or eye drops as very effective treatments for decreasing allergy symptoms. Breastfeeding is very effective at decreasing the risk of allergies. Exposure to other children and animals in the first year of life can also lower the risk of allergies. Once some allergies have developed, avoiding known allergens can calm the immune system and decrease the risk of new allergies. Nasal allergies, Allergic rhinitis, Hay fever, Seasonal allergic rhinitis, Perennial allergic rhinitis, Pollen allergy, House dust allergy, Pet allergies, Mold allergies.